Angelika Platen, A. R. Penck, 2003. Courtesy Galerie Michael Schultz. A. R. PENCK WAS A CHARMING CHARACTER WITH A WRY, ironic sense of humor and an infectious smile that always seemed to embody the wit and complexity of his works. His truly exceptional role in the development of East German underground art (a term he claimed to coin) is still under recognized and under appreciated, even while his large-scale paintings, often prominently featuring his iconic elongated stick figures, have found widespread acclaim since the 1970s for a unique symbolic language that is both deeply expressive and highly conceptual. While his style is gestural and visceral, he was calculated, skeptical, and anti-ideological, as he objectively examined the conflicting systems—political, economic, social—present in his world. Due to his outsider position, Penck unabashedly and unknowingly bridged aesthetics that otherwise seemed at odds. In East Germany, where he lived until 1980, Penck was not known by his world-famous pseudonym. Rather, he was Ralf Winkler, a precocious, gregarious, and vibrant conductor of the avant-garde art world. He lived and worked primarily in his hometown of Dresden—a city that the East German government still saw as a cultural center even after it had been heavily bombed by British and American forces in 1945 (when Penck was six years old). 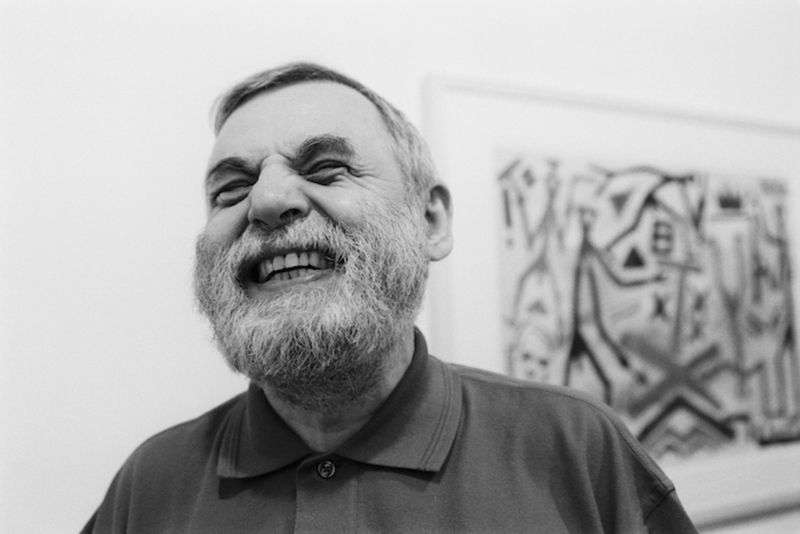 Penck started making art as a teenager in the late 1950s, when he took an amateur painting class with Jürgen Böttcher (now known as Strawalde) at a local community college. Böttcher and his students became known as unofficial, nonconformist artists, and made work that stood in stark contrast to the exclusive program of state-sponsored socialist realism taught at art academies throughout East Germany. Learning about the history of painting from Böttcher, who invited pupils to his apartment in the evenings to flip through contraband art books and listen to jazz music, Penck found himself taken by the portraits of Rembrandt and the works of Pablo Picasso and Georges Braque. In 1961, a twenty-two-year-old Penck helped Böttcher with the documentary Drei von Vielen (Three of Many), which chronicled the lives of three of Penck’s classmates as they worked at state-sponsored day jobs and painted or sculpted in their leisure time. Drei von Vielen made the controversial claim that a socialist citizen of East Germany could both hold an official state-sponsored job and be an artist. The film’s message of artistic “freedom” proposed an alternative to official culture, while its collaborative aspects—sharing art with friends and the community—showed how these artists could in fact reinforce the collective aims of socialism. At the end of the film, Penck makes his cameo: The movie’s three subjects visit their friend “Ralf Winkler,” in his in his apartment, to critique one another’s artworks. Winkler comes across as the most serious of the group—the painter, the critic. He presents the group a stark painting (now lost) of a burning building, in which people can be seen falling from windows and lying dead in the street. He explains that it is a depiction of the Allied bombing of Dresden, which he witnessed as a child. With the building of the Berlin Wall, the East German authorities cracked down on what they saw as dissident cultural activities, Drei von Vielen was banned, and Penck became known among officials as an instigator of avant-garde dissidence. He was denied entry into the Verband Bildender Künstler (East Germany’s state-sanctioned artists union) despite support by several Dresden artists and was consistently placed under surveillance and even harassed by the State Security Force (Stasi). But in 1965, Georg Baselitz, a friend of Penck’s who had managed to leave East Germany, covertly introduced the artist to West German dealer Michael Werner. The three met in a park outside East Berlin. Penck arrived with a suitcase full of paintings and drawings—unfurling canvases and shuffling through drawings for Werner to see. Werner, instantly impressed, went on to give Penck his first solo show in 1968 at Galerie Hake in Cologne. 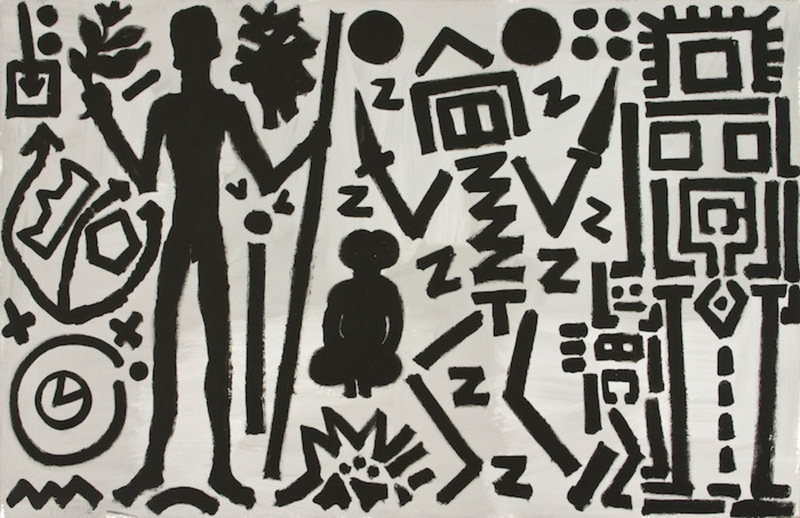 A. R. Penck, Welt des Adlers IV (Eagle’s World IV), 1981, acrylic on canvas, 70 7/8 x 110 1/4”. Courtesy Michael Werner Gallery, New York and London. It was then that the artist finally took on his pseudonym, after the German ice-age geologist Albrecht Penck. (The R stood for Ralf.) From that point on Penck’s international reputation only grew. Earlier in the ’60s, he’d begun creating paintings such as his famous Weltbild (World Picture), 1961, or Grosses Weltbild (Large World Picture), 1965. These interrogations of Cold War politics were shown in Western Europe in the late 1960s. As his story came out through these works critics and curators framed him as an anomaly in the East, a renegade painter, a loner trapped behind the Iron Curtain. Throughout this time in Dresden, he continued to play an integral role in the city’s unofficial art world. His contagious energy and vibrant personality drew people to him; he was always at the center of whatever activity was happening. Among his more revolutionary acts, Penck started the artist’s group Die Lücke TPT in 1971, which strove to locate art’s socialist, collectivist potential neither in its aesthetics nor in the impact of its dissemination but, instead, in the process by which it was made. The group’s name means “the gap”—referencing the void Penck saw in the sterile, noncollaborative world of official East German art, while playing on the Expressionist group Die Brücke. Members worked collaboratively, making dozens of communal abstract paintings, producing 16-mm films, and staging performances, often musical in nature (Penck was an enthusiastic drummer and was often seen at a piano—music was his other true passion). They publicized their events by giving handmade invitations to a select few and then letting word of mouth do the rest. Spontaneity was an important aspect of these events. Sometimes only two or three people came. Sometimes it was thirty. In 1976, Die Lücke dissolved, in part due to the pressure of constant Stasi harassment, in part because it had run its course. Penck was forced to join the People’s Army for six months. Afterward, he left Dresden for the countryside to focus on his own work. That same year, another event shook the East German world of nonconformist art: Penck’s friend, the folk singer Wolf Biermann, was stripped of his citizenship. Outrage and fear ran through the arts community. Penck knew that his time in East Germany was likely limited. In 1979, his studio was mysteriously broken into and ransacked under circumstances that remain unclear to this day. He then applied for an exit visa—a long, uncertain, and stressful process. During this time, Penck made an artist’s book called Ende im Osten (End in the East). The drawings are dark, bold, and aggressive in nature. It is clear he is dealing with many emotions—anger toward a system that never accepted him and the imminent loss of a home in which he was no longer welcome. On August 3, 1980, Penck left Dresden in the middle of the night, without any of his possessions. Penck once said that “no one is spared from moving through society directly.” His statement describes succinctly his approach to both art and life. Whether he was secluded in East Germany or traveling the world, Penck was inevitably engaged in and with society’s systems. While rejecting the stylistic tenets of socialist realism and embracing abstraction and Expressionism, Penck and his fellow unofficial artists still remained skeptical that Western capitalism’s focus on the individual would be an adequate solution to the ever-present issue of postwar German identity formation; instead, they attempted to carve out their own artistic space within the oppressive system of socialism itself. During this time, Penck, like the figures in his paintings, straddled two realms—the precarious, secret world of underground art in East Germany, and the burgeoning postwar international scene in which he participated in absentia but where his works found such renown. Hannah Klemm is assistant curator of modern and contemporary art at the Saint Louis Art Museum, and is currently completing her dissertation on A. R. Penck at the University of Chicago.